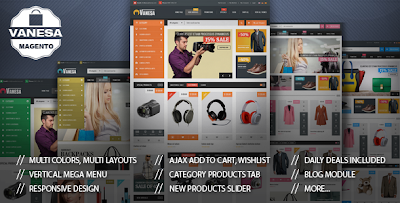 Vanesa is a Mega Store Magento Theme from Plazathemes. It’s great choice for a lot of stores : fashion for men and women store, gift store, clothing store, mobile store, digital store, shoes store, accessories store,... Vanesa is a premium high-end solution for your eCommerce business. Responsive layout is well-performed on any device, from PC, laptop to tablet and mobile. Megamenu shows links to Blog, cms page in your website. Vertical Megamenu shows all categories in vertical direction. You can add image or static block in the popup of one category. Category Tabs Slider extension shows products in slider in each tab. You can show categories and sub categories and thumbnail image of them you want by using Category List extension. You can advertise many brands with Brand Slider extension. New products, best selling products are shown beautifully in slider. Static blocks with nice images and helpful information help you advertise your website better. Blog extension and Testimonial extension bring you come closer with customers. Item Reviewed: Vanesa New Mega Store Responsive Magento Theme 9 out of 10 based on 10 ratings. 9 user reviews.